A cooking challenge organized by Meg of Grow and Resist and Briggs of Oh Briggsy in which we explore a featured cookbook each month. The selection for September is Jerusalem, a Cookbook by Yotam Ottolenghi and Sami Tamimi. Oh man, do I ever love this book. 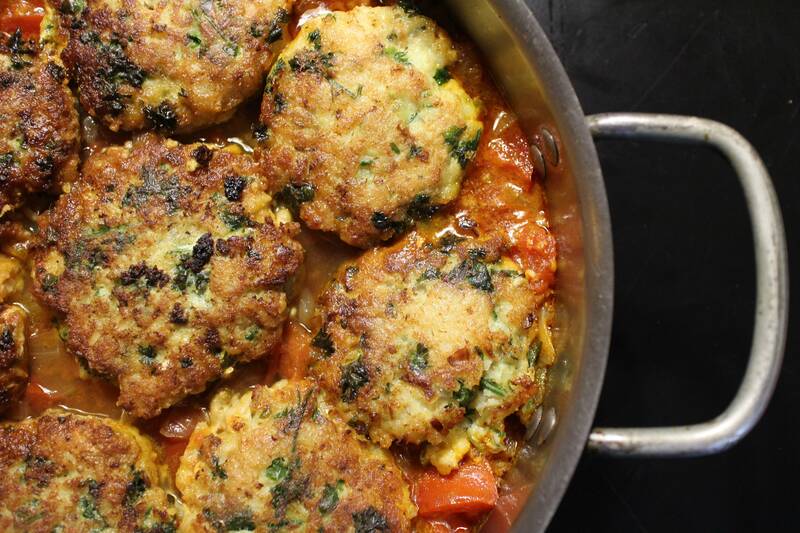 I follow Yotam Ottolenghi’s weekly column in The Guardian like a hawk, have checked his vegetable cookbook Plenty out of the library more times than I can count, and enjoyed the cookbook Ottolenghi, which like Jerusalem, was co-authored with Yotam’s business partner Sami Tamimi. I therefore really looked forward to immersing myself in Jerusalem for a month. First of all, I appreciate how inventive these two are in the kitchen, combining fresh ingredients in new and old ways, creating a cross-cultural experience that, in their view, epitomizes their hometown of Jerusalem. I totally get it, the reference to Jerusalem. I’ve been to the city of Jerusalem and other places in the Middle East where histories and cultures compete, clash and co-exist. Jerusalem was a moving experience for me because of the layering of history, religions, cultures, and rituals. For Yotam and Sami, it is home. While the rest of us might put nearly cosmic significance to a place with the capacity to invoke awe, Jerusalem to them invokes family. And therefore, this book is a personal collection of inspired recipes that range from traditional dishes made by the authors’ mothers and aunts to modern interpretations that are both fresh and familiar, and worthy of service in their wildly successful restaurants in London. To cook the book, I roamed freely among its many ideas, crossing back and forth between Sami’s Palestinian take and Yotam’s Jewish one, and nodding at the commonalities. With my preference for local, in-season vegetables, I encountered a couple of surprises. One, that the season for cauliflower overlaps the season for eggplants, led me to Maqluba (pages 127-8). 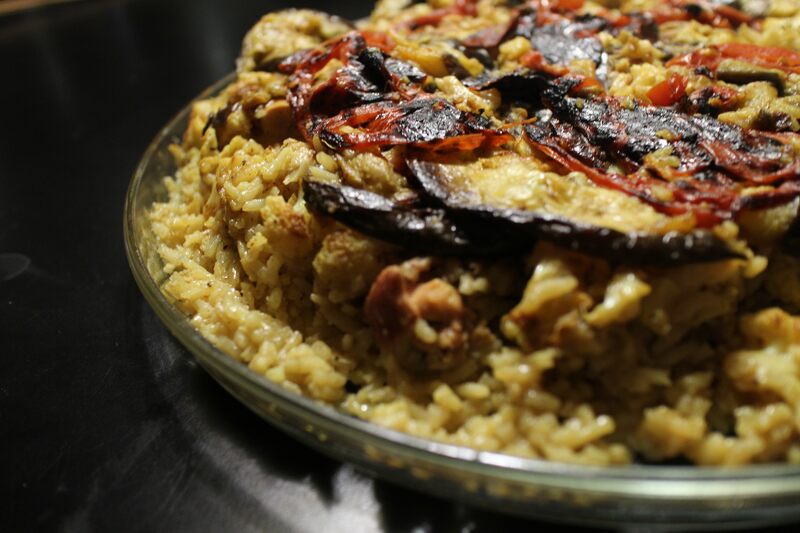 Maqluba in Arabic means “upside down” and is one of Sami’s family dishes. It was a delicious mess, with layers of tomatoes, eggplants, cauliflower, chicken and rice stewed in spicy chicken stock and inverted onto a platter. My family continues to rave about it, so it will reappear at our table, as will Chicken with caramelized onion and cardamom rice (page 184), which the authors claim is “the definition of comfort food.” It is. 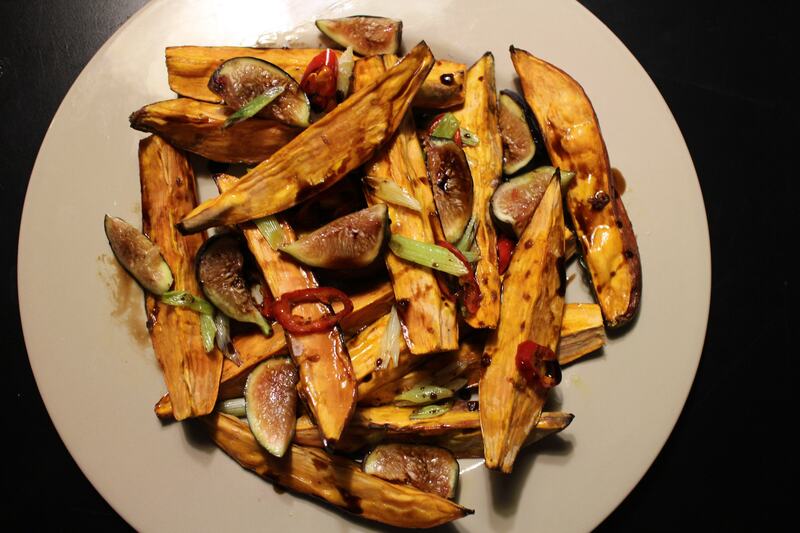 Another pairing that shares a common local season, again to my surprise, is the combination of sweet potatoes and figs. Reading Sami’s recollection of summers of fresh herbs and ripe figs set the stage for our enjoyment of Roasted sweet potatoes & fresh figs (page 26), a stunning combination pulled together by an unctuous reduction of balsamic vinegar and sparked by snippets of green onion and red chili pepper. This was one of our favorite dishes from the book. A further gift from Sami’s family is the story of his grandmother stringing okra on a thread to dry it. I want to try that. 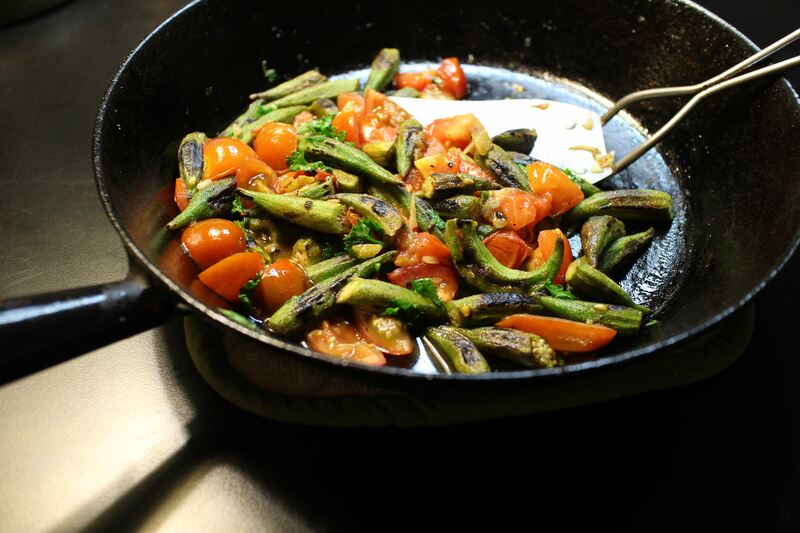 In the meanwhile, Charred okra with tomato, garlic & preserved lemon (page 74) was so successful that we made it twice, using the abundance of okra that I picked at our CSA two weeks in the row. With my stash of preserved lemon running low, I can’t wait to try Jerusalem’s version, with whole lemons. I bet they’ll be so pretty that I won’t want to hide them in the fridge. 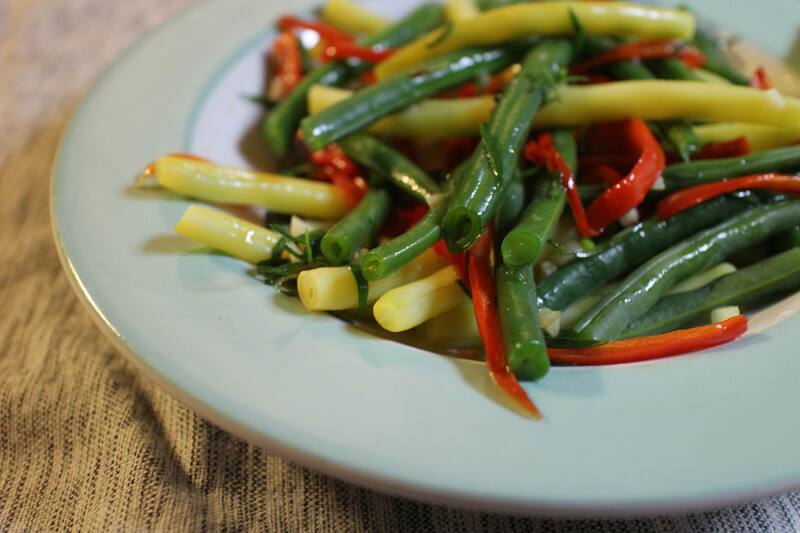 Seasonal Mixed bean salad (page 42), with yellow wax beans, green string beans, red peppers, and abundant chopped herbs, was as picturesque at my house as the photograph in the book. The light lemon dressing with coriander and cumin seeds gave it a lift. 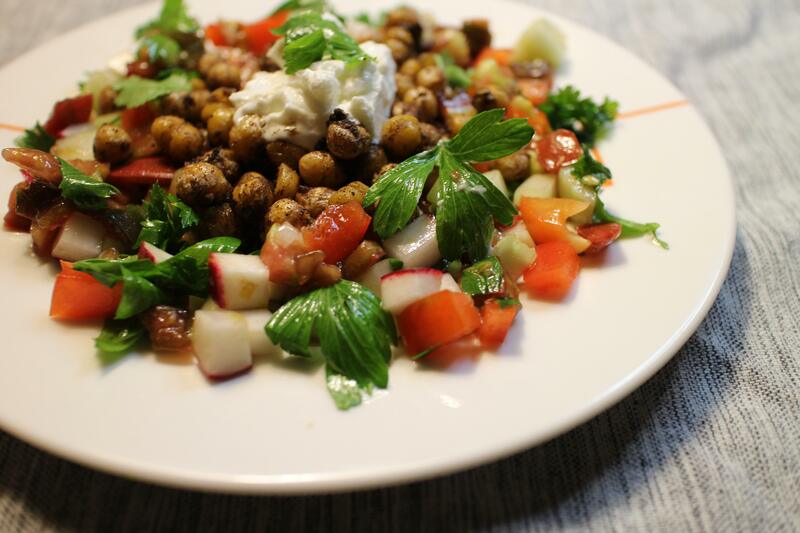 Same with the cardamom, cumin and allspice that bedecked the chickpeas in a chopped salad of seasonal tomatoes, radishes, cucumbers, and onion (Spiced chickpeas & fresh vegetable salad, page 56). There, the combination of lemon juice and sherry vinegar created a light and piquant dressing that had a subtle richness to it. It too was refreshing enough to have been repeated (without chickpeas) a couple of times over the month. Sami’s mother’s fattoush will be just as good and is on the list. With lovely long sweet red peppers from the farmers market, I finally made something from Yotam’s family repertoire: his mother Ruth’s stuffed Romano peppers (page 165). I make stuffed peppers all the time and this is a good one to repeat. I found that splitting the raw peppers ¾ of the length and (my own touch) a ¼ inch horizontally at the stem end, made it surprising easy to remove the seeds and add the filling of spiced lamb and rice. In the future, I’d make them well ahead and serve them at room temperature since the leftovers we ate the next day were even better than the first. The filling was made with the spice mixture Baharat (page 299), a grind of black peppercorns, coriander seeds, cinnamon, cloves, allspice, cumin, cardamom and nutmeg. 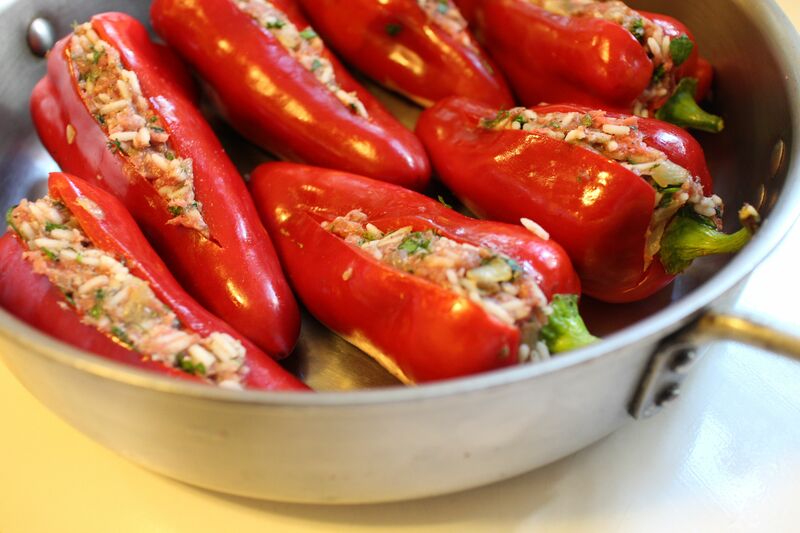 I was very pleased to have made the full recipe since we used it all month, not only in the stuffed peppers but also in the Maqluba. Oh, and while I was into ground meat, I tried the delicious Lemony leek meatballs (page 44) which I liked in flavor. I wasn’t so keen on the texture since I’m not a fan of ground beef. 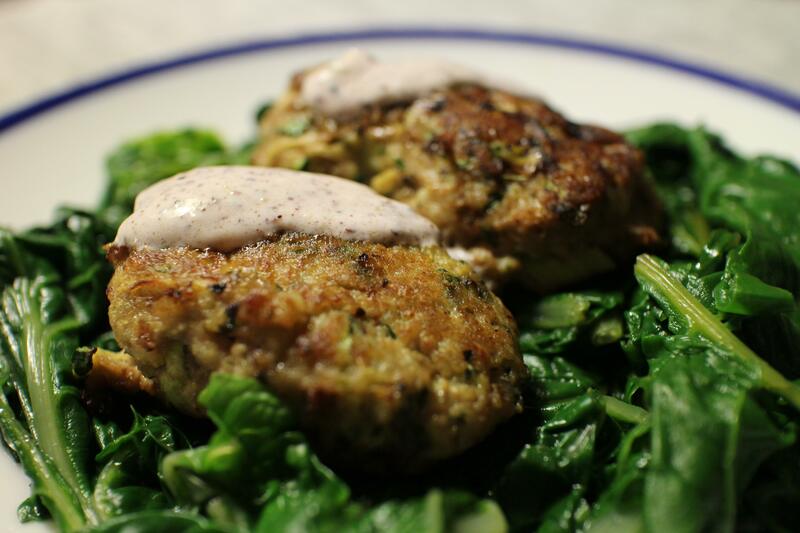 However, the Turkey & zucchini burgers with green onion & cumin (page 200) were great and will become a standard around here, especially in the season when zucchini is so abundant. What I especially like about the burgers is the sauce of sour cream, Greek yogurt, lemon juice and zest and sumac. I’ve since made this sauce for other uses, and it’s really versatile. Unlike some of the other Cook the Book challenges (especially Asian Dumplings and Gran Cocina Latina), I didn’t have to shop for ingredients that I don’t usually have in my kitchen, since my pantry always contains sumac, tahini, and pomegranate molasses, among other staples of Middle Eastern food. The pomegranate molasses came in handy to pep up Fried cauliflower with tahini (page 60), featuring yet another sauce that will find a new life. 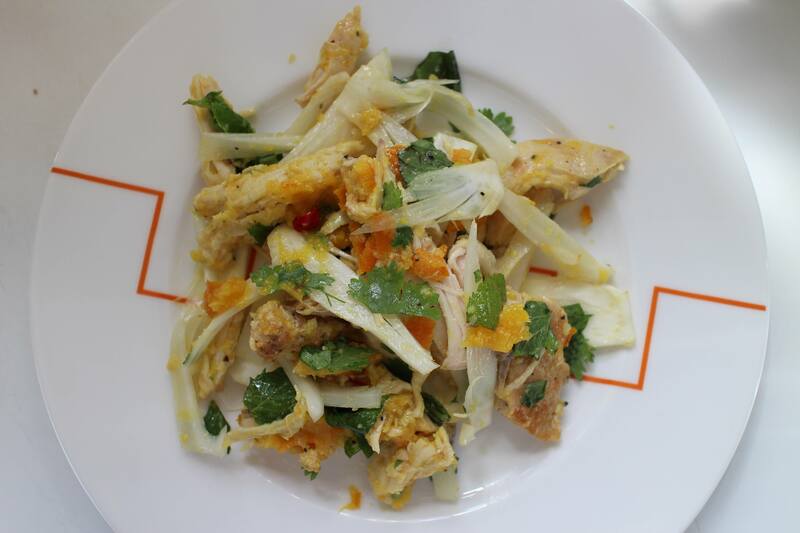 Then there was the boiled orange sauce that accompanied Saffron chicken & herb salad (page 188), which I made for a festive al fresco lunch. Seasoned with cilantro, basil and mint from my garden and tossed with thinly sliced fennel from our CSA, this was a light and refreshing late summer meal. The orange puree keeps for a while and was useful stirred into tomato sauce and also into a fish stew. It would work well with light white fish or scallops. 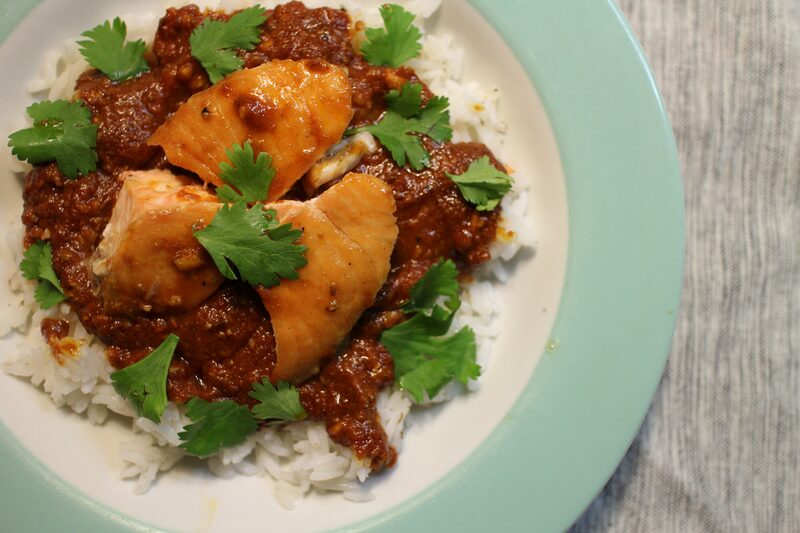 Further on the subject of sauce (alright already), I couldn’t resist Salmon steaks in chraimeh sauce (pages 234-5). Chraimeh sauce is a North African — Libyan — concoction, which is red from tomatoes, spicy from chili pepper and garlic, and aromatic from spices such as caraway, cumin and cinnamon. The authors’ statement that the flavor of the fish is irrelevant since it’s only a vehicle for the sauce is true. I found chraimeh delicious on poached eggs and on chicken. It reminds me a bit of my favorite Romesco sauce. The fact that there’s such a nice section of the book on fish is a self-admitted testament to Yotam and Sami’s immigration, since Jerusalem itself is not a city of fish. I liked the Cod cakes in tomato sauce (page 225) though I regret adding water to the tomato sauce while braising the browned cakes. 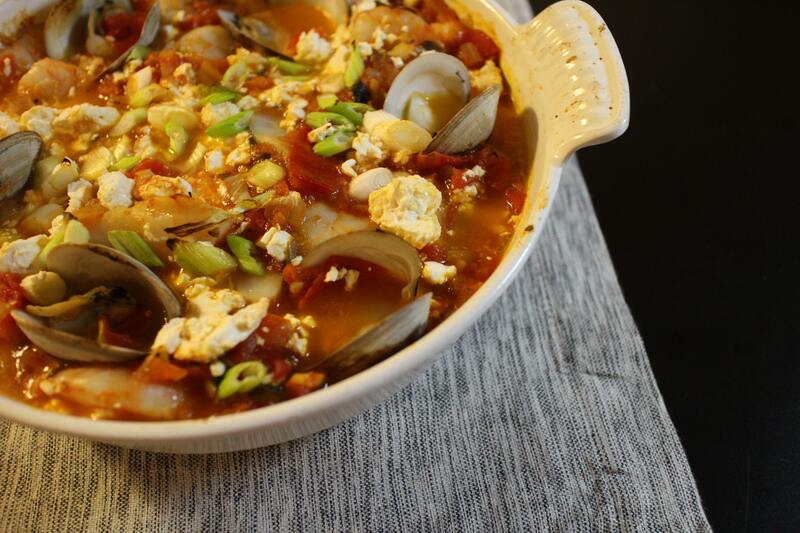 While I agree that fish and cheese are an odd combination, Prawns, scallops & clams with tomato & feta (page 233) is a winner. It’s the feta that makes it work. I can see adapting this for a vegetarian version with eggplants and zucchini, a kind of Middle Eastern ratatouille. By now you’re saying, WHOA, STOP, ENOUGH. I will not go on and on any further here but I can honestly say that this is one of those books that I could cook cover to cover and also dissect to use as inspiration. I’m glad I left the sticky notes in the desk. I won’t need them. I can open to just about any page and be satisfied.